Special while supplies last! FREE TP-cj56L Jacket (56mmx62mm long) Water Jacket with TP Motor Purchase, $20 Value! 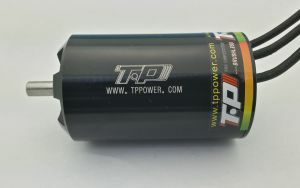 56mm Diameter by 106mm Long Brushless Motor. Hand wound for high efficiency of up to 90%. Comes with high quality bearings and neodymium magnets for high power. Large vented front and rear endbells for additional heat dissipation.